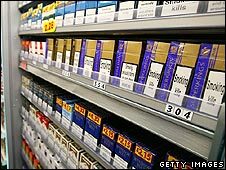 The Office of Fair Trading (OFT) has alleged tobacco firms and supermarkets have been engaged in unlawful practices linked to retail prices for tobacco. The OFT names 11 retailers, including Asda, Sainsbury and Tesco, and tobacco firms Imperial Tobacco and Gallaher. One allegation is that retailers and tobacco groups arranged to swap information on future pricing. A separate allegation is that there was an understanding that the price of some brands would be linked to rival brands. Imperial Tobacco owns brands such as Embassy, John Player Special and Lambert & Butler while Gallaher's best-selling products include Benson & Hedges and Silk Cut. The OFT said understandings between cigarette companies and retailers between 2000 and 2003 limited the retailers' ability "to determine its selling price independently". In the case of Gallaher, Imperial Tobacco, Asda, Sainsbury, Shell, Somerfield and Tesco, there was an indirect exchange of proposed future retail prices between competitors, it adds, allegedly between 2001 and 2003. "This is not about price fixing," an OFT spokeswoman said. "This is about retail price co-ordination, which is also illegal. "We have information that manufacturers and retailers were indirectly exchanging information about future prices." Michael Pullen, a competition lawyer at the firm DLA Piper, told BBC News that, to the layman, what was being alleged was the same as price fixing. "In order to fix prices you would need an express agreement between two manufacturers, and the OFT have not found any evidence of any agreement which is why they can't allege price fixing but they are alleging price coordination and there is a subtle legal distinction," he said, adding, that to a layman, "in practice the effect is the same". In a statement, Imperial Tobacco said it "takes compliance with competition law very seriously and rejects any suggestion that it has acted in any way contrary to the interests of consumers". In a public response, Tesco said that "the OFT's investigation appears to centre on major tobacco companies. We do not believe that Tesco has acted in a way that has harmed consumers and we will make this clear to the OFT when we see the details of their allegations". The OFT has been building up its case in secret for five years and refuses to say whether it has been helped by a whistleblower, the BBC's business editor Robert Peston said. Even now, the OFT says there should be no assumption that any of the named companies have broken the law. But if they are found to have done so, they could be fined up to 10% of annual turnover - or tens of millions of pounds. "For markets to work well for consumers, it is a fundamental principle that pricing decisions should be made independently," said OFT chief executive John Fingleton. "If we find evidence of anti-competitive activity, we are prepared to use the appropriate powers to punish the companies involved and to deter other businesses from taking part in such behaviour," he added. "If proven, the alleged practices would amount to a serious breach of the law."